Ages: 6 months+ Technique: Roasting. Check out our cooking guide to learn which other vegetables require this method of cooking. 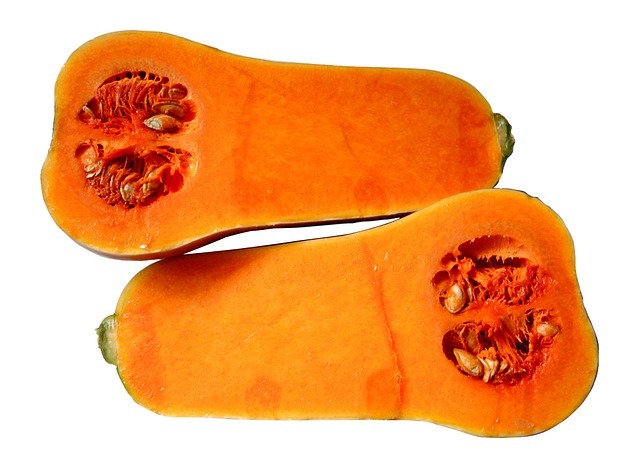 With its sweet taste and easy-to-digest profile, squash makes an ideal first food for your baby. The vegetable is also an excellent source of vitamin C, a nutrient that strengthens the immune system and protects the body against infections. Preheat the oven to 375 degrees. Line a baking sheet with parchment paper, then fill the baking sheet with water until the water fills 1/4 up the sides of the sheet. Use a large sharp knife to halve the squash lengthwise, then use a spoon to remove the seeds. Place squash halves face down in a baking pan. Bake for approximately 40 minutes to 1 hour. Skin should be puckery and/or wrinkled and squash should feel soft when pressed. Scrape out the squash and then puree to creamy consistency. Add water if needed. Storage instructions: Store squash puree in the refrigerator for a maximum of three days or freeze in individual servings for up to three months. Do not refreeze defrosted food.